This is a pulp I own and read recently. The scan is of the copy I read. The cover is by Kirk Wilson, one of the lesser-known pulp cover artists who did about a dozen and a half covers for various Western pulps during the Fifties, as well as interior illustrations for men’s adventure magazines during the Sixties. That’s really all I know about him. For many years, THRILLING WESTERN was the home of the Walt Slade series by A. Leslie Scott, writing as Bradford Scott, as well as the Swap and Whopper series by Syl McDowell. By this point in its run, those series had dried up and the magazine was publishing all stand-alone stories. The lead novel in this issue is “Satan’s Range” by Joseph Chadwick, and at 55 double-columned pages, it actually is long enough to be called a novel, at least one that could have been published as, say, half of an Ace Double. Years ago I read some of Chadwick’s pulp novels featuring the Thrilling Group’s series characters Jim Hatfield, the Rio Kid, and the Range Riders, and I didn’t like them much. The writing was okay, but I felt like he didn’t have a good grasp of the characters. So I’ve tended to avoid his work. In recent years, though, I’ve read some of his stand-alone Western stories that I liked a lot better, so it may be he was just one of those authors who’s not cut out for writing series books. 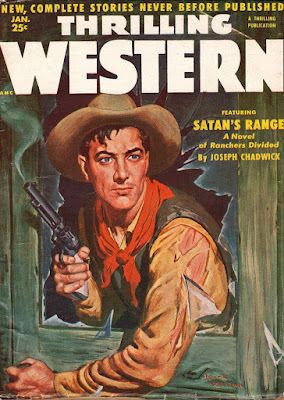 “Satan’s Range” is an excellent hardboiled range war yarn that finds the protagonist, rancher Ed Conover, caught between the local cattle baron/range hog and the smaller ranchers in the area, who are not very trustworthy or likable, either. Conover has enemies on all sides, but the situation worsens when he has to testify in the murder trial of a neighboring rancher, who is married to a beautiful woman for whom Conover has fallen, although he’s too honorable to act on his feelings. Chadwick really puts Conover through a lot in this story, and every time it looks like he’s going to come out on top, something else bad happens. I enjoyed “Satan’s Range” quite a bit, enough that I’m going to have to pull some of my Chadwick paperbacks down from the shelves, and I may see if I have any of the hardboiled mysteries he wrote under the name John Creighton. John Prescott wrote a number of paperback Westerns during the Fifties and Sixties, none of which I’ve read, but based on his short story “The Medicine of Malpais”, he was a pretty good author. This tale of a couple of prospectors in Arizona and their encounters with a band of Apaches is very well-written and doesn’t play out like you might think it would. Prescott does a good job with the narrator’s distinctive voice. D.D. Sharp wrote both Westerns and science fiction and turned out a couple of dozen stories in his career, but I don’t recall ever reading anything by him other than his short story in this issue, “Tenderfoot Beef”. It concerns an elderly sodbuster put on trial for rustling and is also well-written, but it suffers from never really amounting to much, plot-wise, and reads almost like the first chapter of a larger work. “If We Die, We Die” by Worley G. Hawthorne has an unusual setting for a Western pulp yarn, the end of the Civil War, as a stagecoach driver faces problems delivering the message that the war is over. It’s an interesting plot and the story has some good action. Hawthorne is totally unknown to me and has only three stories listed in the Fictionmags Index, all around this time and appearing in Thrilling Group Western pulps. I don’t know what happened to him, but based on this story, he had some talent. There’s one novelette in this issue, Ray Gaulden’s “Me, Gunman”. It’s a bit of an oddity for the Western pulps in that it’s written in first person. The narrator is hired gun Wes Durgan, who’s on his way to a job when he comes across a beautiful redhead taking a bath in a creek. Before you know it, he’s mixed up in a mystery that involves not only the redhead but also a beautiful saloon singer who’s an old flame of Wes’s. He’s accused of murder, and while he’s never in any real danger of being convicted for the crime, he still wants to get to the bottom of things, which he does in very good hardboiled fashion. This is the second pulp story of Gaulden’s that I’ve read in recent months, and I enjoyed both of them quite a bit. I really do need to read some of his novels. There are also assorted features in this issue, which as usual I skimmed but didn’t really read. The features aren’t why I collect Western pulps, although I do enjoy the occasional poem or column by S. Omar Barker. Overall, this is a really good issue of THRILLING WESTERN. The Chadwick and Gaulden stories are excellent, the Prescott is pretty good, and the other two are reasonably entertaining. If you have a copy on your shelves, it’s worth pulling down and reading. John Prescott won a Spur Award for best historica fiction in 1954 for Journey by the river. I conseil his Valley of wrath with its rather unusual set, in Arizona during the Civil War. It's full of historical colour as well as action. As for Ray Gaulden I rate a good novel his Glory Gulch (aka Five Card Stud, see the movie starring Bob Mitchum and Dean Martin). And under the pseudonym of Wsley Day I conseil Long Day in Latigo. I just ordered a copy of LONG DAY IN LATIGO. I didn't realize Wesley Ray was really Ray Gaulden. Thanks for the recommendation! Talkin' about the mysterious Worley G. Hawthorne, I've find this and other pieces about a guy with the same name. Could it be the same person? A pastor it seems! Thanks for the info about Hawthorne. I know of at least two other Western writers who were also preachers.